The dew point is the temperature at which moisture condenses out of the air. It is related to the humidity ratio — the mass of water that is present per mass of dry air. The drier the air is, the lower the dew point temperature will be. For example, a dew point temperature below freezing indicates very dry air. On the other hand, a dew point temperature of 70 degrees F would occur on a humid, muggy day. Below you will find the step by step process that will teach you how to calculate dew point. 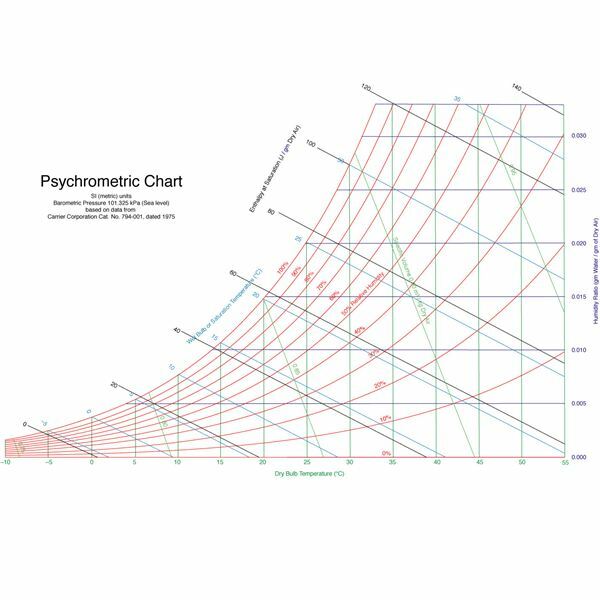 You can also calculate dew point by using a psychometric chart as noted below. The first step when calculating dew point, is determining the relative humidity (RH). Relative humidity measures the amount of moisture in the air relative to the maximum amount of moisture the air could hold. Relative humidity is measured using a hygrometer, but you can also determine RH from the dry bulb and wet bulb temperatures. Dry bulb temperature is the air temperature taken with a normal thermometer. Take the wet bulb temperature simply by using a normal thermometer with a wet cloth wrapped around the bulb. Subtract the wet bulb temperature from the dry bulb temperature, then consult a chart to find the relative humidity. Relative humidity can be expressed as a ratio of the saturation vapor pressure at the dew point temperature to the saturation vapor pressure at the air temperature. This is expressed by the formula RH = 100*(e/es). Rearrange the equation to find e, the vapor pressure at dew point: e = (RH*es)/100. Now the only unknown on the right side of the equation is es. Calculate es using the formula es = 0.6108*e[17.27T/(T + 237.3)], where T is the air temperature in Celsius and the kilopascals (kPa) are the units for es. Then plug RH and es into the equation for e to find the vapor pressure at dew point in kPa. You can now calculate the dew point temperature from the vapor pressure. The equation is e = 0.6108*e[17.27Td/(Td + 237.3)], so the dew point temperature, Td, is the only unknown. Rearrange the equation to get (Td + 237.3)*log(e/0.6108) = 17.27Td. Move all the unknown variables to one side of the equation to get 237.3*log(e/0.6108) = Td[17.27 – log(e/0.6108)]. Solve for Td to get Td = [237.3*log(e/0.6108)]/[17.27 – log(e/0.6108)]. Plug in the value you calculated for e to find the dew point temperature. You can skip the dew point/humidity formula and estimate the dew point temperature graphically using a psychrometric chart. Calculate the relative humidity as in step 1 for the formula. Locate the air temperature on the bottom axis of the chart. Move up in a straight line until you reach the curved line with the appropriate RH reading. From the intersection of these two lines, move left horizontally to the curved left axis on the chart. The temperature reading at this point is your dew point temperature.